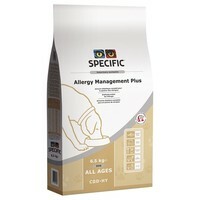 Specific Food Allergy Management Plus COD-HY Dry Food for Adult Dogs is a complete and balanced hypoallergenic diet developed to provide optimal support for dogs with concurrent food allergy and atopy. Made with a uniquely high level of Omega fatty acids that actively support your dog’s skin and coat, the food can also have a beneficial effect on other responsive inflammatory conditions such as colitis, asthma or arthritis. The high-quality and highly-digestible ingredients are also low in fibre, and have increased levels of electrolytes; making this food especially useful for patients with gastrointestinal problems related to acute intestinal absorptive disorders, maldigestion and/or pancreas insufficiency.